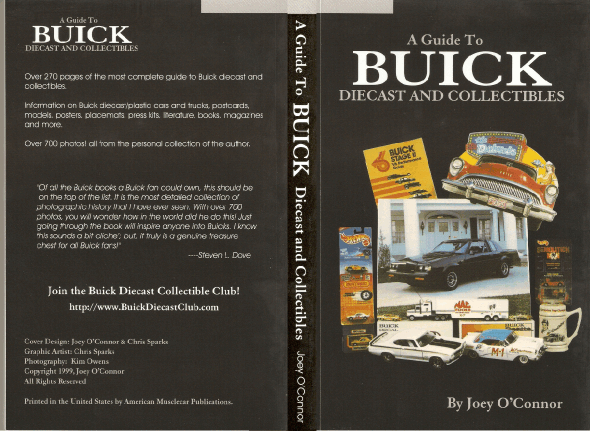 A Guide to Buick Diecast and Collectibles, by Joey O'Connor, is 276 pages with over 700 photos of the most complete guide to Buick diecast and collectibles. Information and collector values on Buick diecast/plastic cars and trucks, postcards, models, posters, placemats, press kits, literature, books, magazines and more! Racing related and regular production related. Our New Facebook Fan Page! ONLY A FEW HUNDRED COPIES LEFT IN INVENTORY! Thousands Were Sold at The $24.95 MSRP! Your final chance to get a copy before they are all gone! This is certainly the time to add this Buick Book to your library or just get a copy to see what is out there in the world of Buick collectibles! Purchase Directly From The Author and Publisher Joey O'Connor to Get This Great Offer! printed in the United States by American Musclecar Publications! WILL BE AUTOGRAPHED and GIVEN FREE SHIPPING! ONLY $14.95! pay with your Credit Card, Debit Card, or Check Transfer by clicking the BUY NOW button below! The fastest way to get your order to you and we will never see your bank account or credit card numbers!